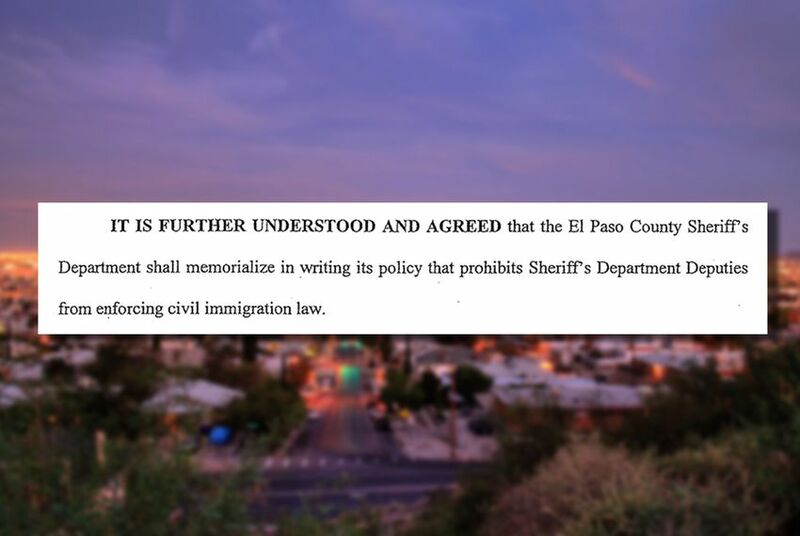 A 2006 settlement between an El Paso County resident and his local sheriff's department could come back and haunt the border town if the Texas Legislature passes its anti-"sanctuary cities" bill. If the Texas Legislature passes a bill to ban so-called "sanctuary cities" in Texas, El Paso County could face a legal quagmire. That's because the terms of a 2006 legal settlement expressly forbid the county's sheriff deputies from doing what Senate Bill 4 demands: enforcing federal immigration laws. The legislation state lawmakers are considering would punish local governments if their county sheriffs fail to honor "detainers" — requests from federal Immigration and Customs Enforcement (ICE) officers to hand over immigrants in custody. SB 4 would also punish those government entities that enact policies preventing local law enforcement from asking people for their immigration status. SB 4 doesn’t require sheriff's deputies or local police to ask for a person's immigration status. But it does prohibit department heads or elected officials from preventing them from doing so. Wiles said any of his roughly 250 deputies could decide they want to be de-facto immigration agents, taking them "out of the field doing that instead of the work we want them to do." "The public expects us to guide and limit the discretion that they have because of the power and authority that law enforcement has to take away people’s freedom,” he said. Texas Attorney General Ken Paxton has assured El Paso County that any local lawsuits over the settlement agreement won't be successful. In a letter to lawmakers earlier this month, he wrote that the settlement didn't qualify as an actual court order. “Parties cannot agree between themselves to trump state law,” he wrote. Untereker said he wasn’t swayed. “We disagree with that opinion,” he said. “A signed settlement agreement is a signed settlement agreement. We can argue as to exactly how much weight it has, but we’re going to be in violation of that” if the county is forced to follow SB 4. The bill, which was approved by the Senate, has made its way to the Texas House for consideration. It remains unclear how much House lawmakers like the current version. State Rep. Charlie Geren, R-Fort Worth, who has authored a companion version of the bill, said on Tuesday that he’s been in recent discussions with attorneys and law enforcement authorities to address some concerns with the legislation. He didn’t specify what those issues were. After hearing more than 16 hours of testimony, the Texas Senate State Affairs Committee voted 7-2 along party lines to advance a bill that would punish local government entities and college campuses that refuse to cooperate with federal immigration officials or enforce immigration laws.